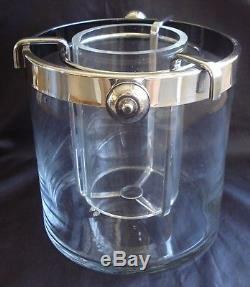 This fabulous rare vintage ice bucket is by CHRISTOFLE FLEURON made in FRANCE. The high quality bucket is large and heavy. 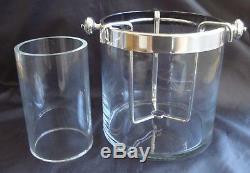 There are two inserts, one insert can accommodate a wine bottle, it is made of lucite. The other larger silver plate insert can. The bucket can also be used alone to hold ice. 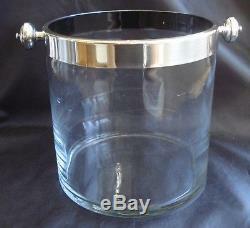 Dimensions: The bucket sits 7 1/2 inches tall, and is 7 1/2 inches in diameter. Sits 6 1/2 inches tall, and is 4 inches in diameter. 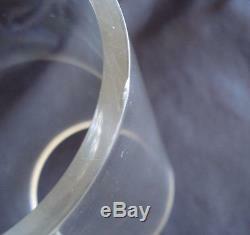 The silver-plate insert is 5 inches in diameter. 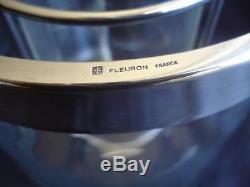 Both the rim of the bucket and the silver plate insert are marked FLEURON FRANCE. 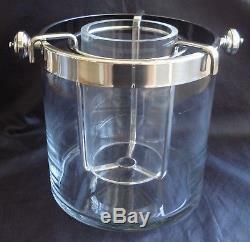 There is a small chip to the edge of the lucite insert, and shelf wear on the bottom of the bucket. Otherwise, this piece is in excellent vintage condition. FEEDBACK IS IMPORTANT: FEEDBACK IS A KEY INDICATOR OF THE BUYERS OR SELLERS REPUTATION. WHEN YOU RECEIVE YOUR ITEM, AND CONFIRM WITH FEEDBACK, I WILL LEAVE FEEDBACK FOR YOU. 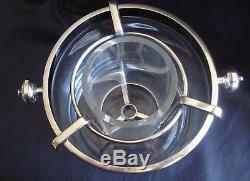 The item "RARE VINTAGE CHRISTOFLE FLEURON WINE-CHAMPAGNE-ICE BUCKET GLASS & SILVER PLATE" is in sale since Monday, December 11, 2017. 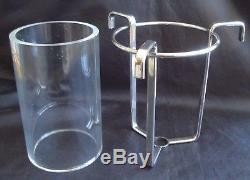 This item is in the category "Collectibles\Barware\Ice Buckets". 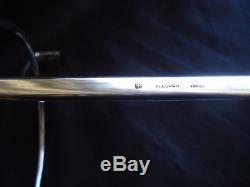 The seller is "roxannesrelics2" and is located in Encinitas, California. This item can be shipped to United States.